Trina was supposed to pick Dad and me up at 6:30 a.m. for our hour drive up to the North Shore. Dad’s a pretty early riser, so he was up at 4:30 putzing around the hotel room, making coffee, etc. My first words to him, “STOP BOTHERING ME!” A sweet way to kick off the day. About an hour later I rolled out of bed and threw on a carefully selected swimsuit for the adventure. I’d been waiting for this day for so long, I had to select the perfect functional ensemble. This was like prom or my weddingg day or some other really special day that I’d been anticipating for a long time. Anyhow, once dressed, dad and I hurried downstairs as our in-room clock struck 6:30. Checking out at the Reception Desk, I noticed the world clocks behind the concierge. “Wait a minute,” I said, “is it 5:30 or 6:30?” Yeah, that’s right. Our in-room clock was an hour off. No worries for dad, who had already downed a pot of coffee and was coming out of the gate at full-tilt. He sat down at the baby grand piano in the hotel bar and played a symphony while I curled up on a lobby chaise and slept. Soon enough, Trina was pulling up in her SUV and we were on our way to the infamous North Shore of Oahu. 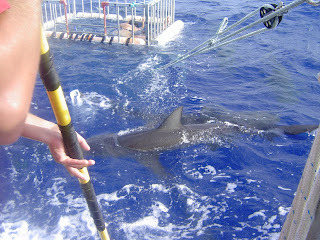 At slip 35, we boarded the shark dive boat and 10 minutes later we were about three miles offshore. The swells were huge, the biggest I’ve ever seen, and we were rolling way up and way down, way back up and way back down. Our boat crew warned us that conditions were deteriorating rapidly and that they might have to call off the excursion at any time. The horizon was all wobbly and if I wasn’t so pumped, I might have hurled. As soon as the boat stopped, dorsal fins immediately appeared all around us and that was it – I was jumping around and squealing, tearing off my clothes and heading for the cage. I could hardly contain myself. Great success! After brief “safety” instructions, Dad, Trina and I jumped at the chance to be the first in the cage. To enter the already submerged aluminum cage, we had to step backwards onto a ladder, but we weren’t really quite sure where our toes were… like, were they in or out of the cage? Shark fins were all around as we backed in - dad first, me second and Trina last. The ocean was incredibly violent, and before we knew it the crew had released the ropes that secured us next to the boat, leaving us trailing about 15-20 feet behind the boat. Putting my face in the water for the first time, I instantly saw at least a dozen BIG sharks around and started squealing WOO-HOO into my snorkel. Trina and Dad were doing the same thing, and we could hear each other hollering many muffled colorful phrases into our snorks. The adventure with the sharks would have been enough, but it felt extra-dangerous with the waves literally wailing on us. I truly expected to gently tread water in the cage and have an easy time, but with every rise and fall of the huge ocean swells, we were slammed against the metal bars and into each other. To avoid getting hurt, we had to hold on very tightly – all the while trying not to let an errant finger or foot slip between the bars. I was trying to take pictures with my right hand and was holding on with just the left, and desperately trying not to further hurt either injured leg and trying not to let any limbs slip out of the cage and into a shark’s mouth - though, that was certainly a possibility with the huge gaps between the bars. And just when I’d get my sights set on a big shark to take a picture, WHAM, I was slammed into the side of the metal cage again. I was completely overwhelmed. 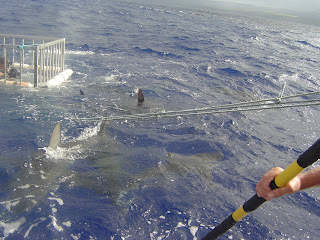 At any given time, there were anywhere from 25-35 sharks circling the cage, and they were big suckas. Dad said the biggest ones were about 10 feet, maybe 12. Galapagos and reef sharks were the main ones, and I thought I saw a Tiger swim by but I can’t be sure. All I know is I kept taking a deep breath at the surface before diving to the bottom of the cage where I could hold on with one hand and look around. I was so mesmerized I almost forgot to come up for air. The water was about 400 feet deep and we couldn’t see the bottom. All you could see was neverending deep, deep blue, and the silvery-white sheen of the sharks. The entire experience was surreal. I was in complete and utter awe to be in my own true life Discovery Channel episode. I can’t wait to do it again! Next time: South Africa with Great Whites? Dad says if you ever get the chance to do this and if you're not a wimp, do it. 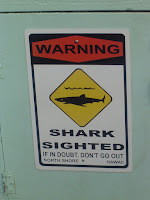 So, after the shark dive we stopped at the North Shore surf hotspots to make Dad’s dreams come true… Waimea Bay, Bonzai Pipeline and Sunset were “going off” as Dad said… over… and over…and over. He was as excited as I had been earlier in the day – the North Shore is to Dad as Shark Diving is to me. He actually used up the entire video camera tape and battery just filming dudes surfing. (You should hear his hysterical narration!) I’ve never seen surf that big in person and Dad said it wasn’t even that huge. Sandwiches from North Shore restaurant Stordo’s with unbelievably sweet bread, papaya seed dressing and sprouts – not something we’d usually eat, but dang, so good. Pickled mangoes from a road-side vendor – again, not something we’d usually eat, but we totally slammed them. Matsumoto’s world famous shave ice with ice cream. Dad got strawberry, I got root beer, banana and strawberry and Trina got Lilikoi, which was so ever-loving delicious.